Sorry for the delay in getting this posted—hopefully everyone has received their fabric by now, so I’m sure you’re all ready to get started on this month’s bee block. Don’t worry if this block looks complicated to you, it’s actually deceptively simple to make thanks to some strip piecing and chain piecing. This block turned out HUGE—unfinished, it should measure 20.5” square. 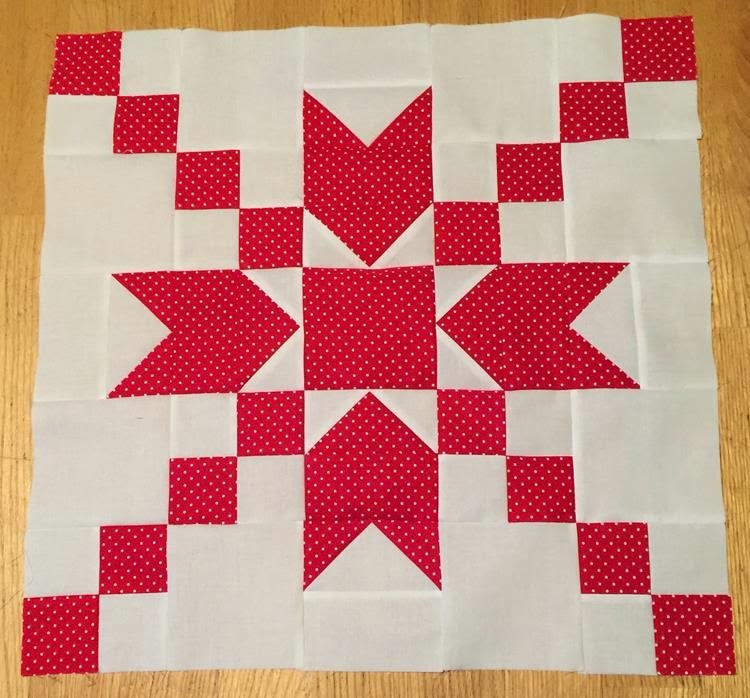 I’ve wanted to make a red & white quilt for a long time now, so thanks so much for helping to make that happen. I hope you enjoy making this block as much as I did designing it. Note: You will have a pretty healthy “scrap” of the red fabric left. It’s all yours—I don’t need it back. 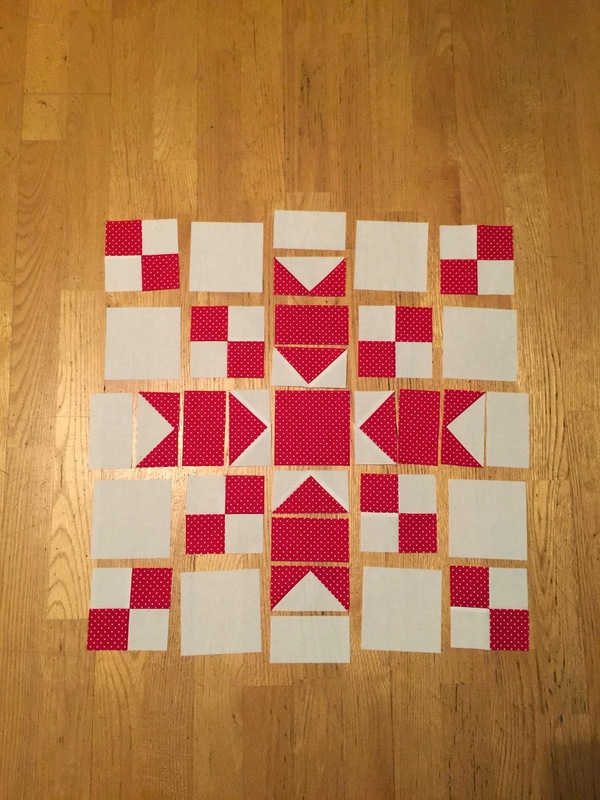 Piecing Instructions:This block is composed of flying geese units and four patch units plus some cut fabric squares/rectangles. - Please press your seams to the dark (red) side of the fabric where possible. This block comes together easily when you can nest your seams together. 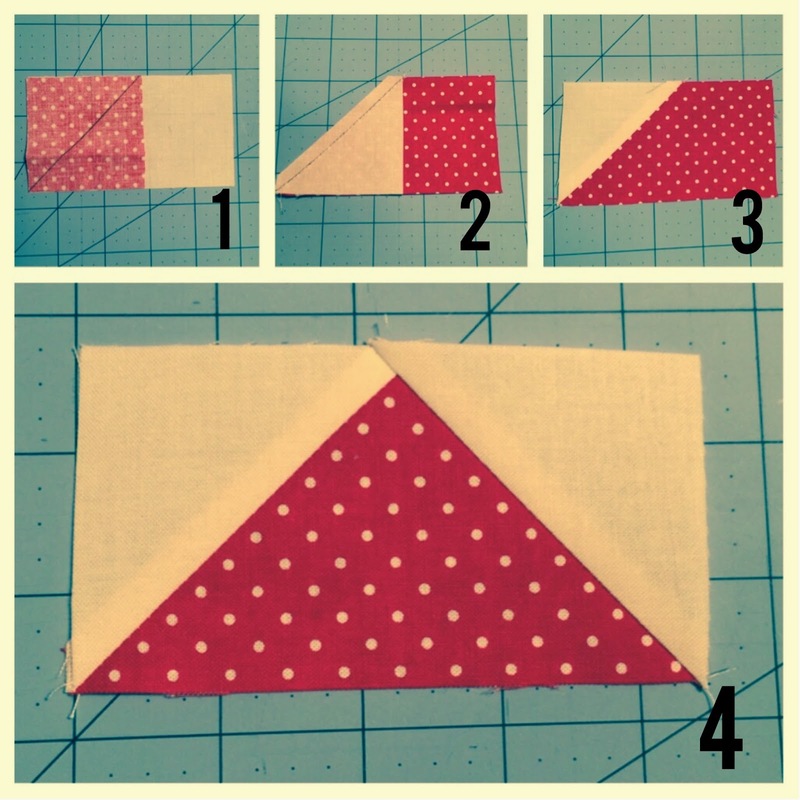 - Use a scant ¼” seam to piece your quilt block. 1. 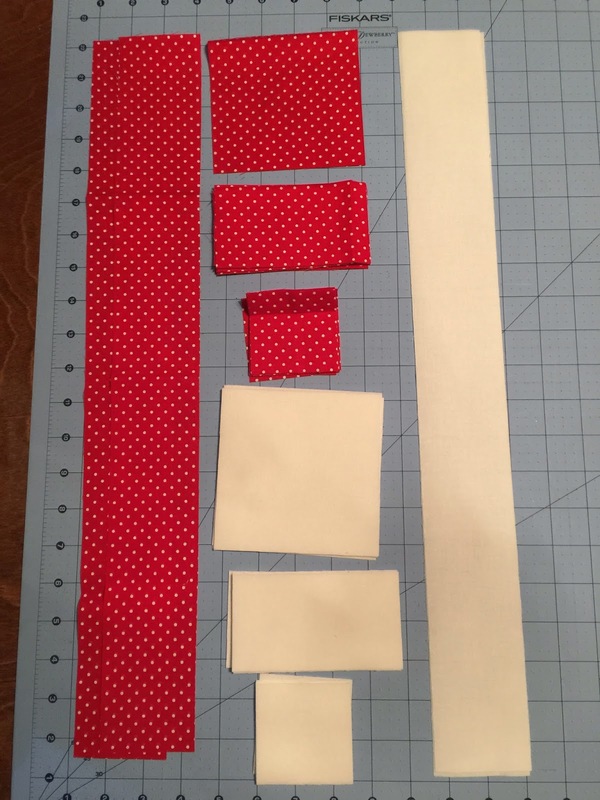 Sew one red 2.5” x 22” strip and one white 2.5” x 22” strip together. Repeat with remaining long strips to create two strip-pieced units. Press toward the red fabric. 2. Sub-cut your strip pieced units into (16) 2.5” segments. 3. Take two sub-cut units, nest your seams and sew the two pieces together. 4. Press four patch unit, pressing seams to the side. Repeat to make a total of (8) four patch units. To make the flying geese units:I use the “flipped corner” method of making flying geese. Using (4) 2.5” x 4.5” red rectangles and (8) 2.5” white squares. Create your red flying geese. You will need a total of four flying geese units with the red fabric as the main fabric and the white fabric as the corners. 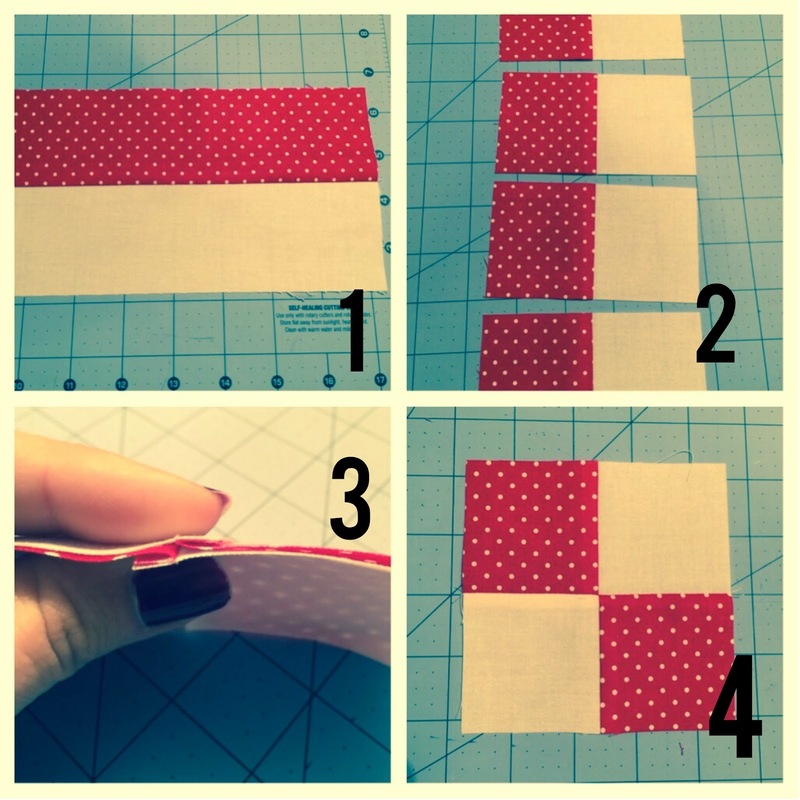 Using (4) 2.5” x 4.5” white rectangles and (8) 2.5” red squares. Create your white flying geese. You will need a total of four flying geese units with the white fabric as the main fabric and the red fabric as the corners. Before piecing together each row, you’ll need to create the “arrow units” by sewing 1 flying geese unit to the adjacent 2.5” x 4.5” rectangle. You will piece together a total of (8) arrow units. P.S. Have you ever tried “webbing” before when chain piecing? 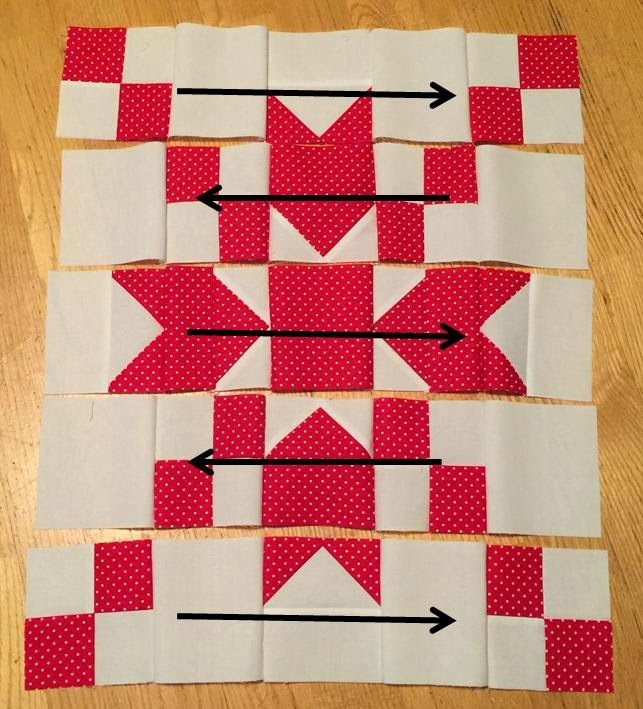 I first heard about this technique on Bonnie Hunter’s Quiltville blog, where she uses it to piece together entire quilt tops. While I haven’t tried that yet, it also works great for piecing together blocks that have several components. The best part? You don’t even have to snip the threads between rows whenever you assemble the entire block! Less cutting means faster sewing! Last, but not least, this block needs a name…any suggestions?